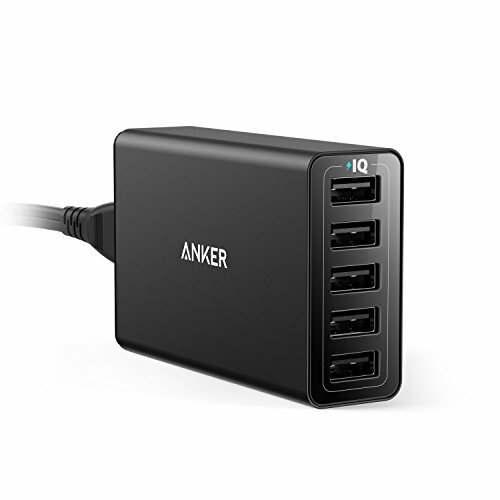 Exclusive to Anker, PowerIQ and VoltageBoost combine to ensure the fastest possible charge. (Does not support Qualcomm Quick Charge). Five ports pump out 40 watts of power, enabling simultaneous multi-device charging. As small and light as a pack of cards, the Anker PowerPort 5 is one of the most compact multi-port USB chargers on the market. - Compatible with Apple and Android smartphones, tablets (including the Nexus 7) and other USB-charged devices. - Do not place PowerPort 5 in an enclosed space while charging. This may cause the charger to overheat. - Do not place any electronics which give off heat on top of PowerPort 5.
; If a port isn't working properly, it may be because your device has triggered the protective internal safety switch. In order to reset the switch, unplug all cables (including power cable) for five seconds and retry. ; This charger is not compatible with the iPod nano, iPod Classic, iPod Shuffle, HP TouchPad and Asus tablets. ; We recommend charging your MacBook while it's turned off or in sleep mode (5-hour recharge time).